In the right season, rhubarb bitters are easy to make at home. Otherwise, you may be able to find Fee Brothers at your local shop. Once you do, pulling together this refreshing recipe is simple. Just combine equal portions of gin, lime and Aperol with a few dashes of bitters. Shake with crushed once and dump the whole works into a tall glass and garnish with an orange twist. Think of the Rhubarb Blush as either an accessory to smother the heat of Thai chili peppers, or as a tart reminder of the last few warm days of summer. This is on the sour side which we prefer, and it's not very potent. Make them big, or make a bunch of them. The Blush is also a nice platform for expansion. You could, for example, change bitters, add some liqueur to augment the flavors and balance the lime, or even strain over fresh ice cubes and top up with sparkling wine. It just goes to show that it doesn't take much to build a good thirst quencher, and it's one more example of a decent cocktail from a popular restaurant in town. Combine the gin, lime juice, Aperol and bitters in a shaker. Fill with ice and shake until well-chilled. 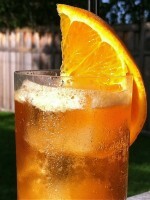 Pour entire contents into a glass and garnish with an orange twist. I know you are no longer in the Twin Cities, but have you heard of and/or tried Norseman strawberry rhubarb gin? I have heard it is great but have not bought any yet. Could it have a role here? I haven't tried it, but it could be amazing here. You never know until you try!